ARTIST IN RESIDENCE IS A COLLABORATION BETWEEN GARDEN & GUN AND PALMETTO BLUFF THAT CELEBRATES THE ARTS, FOSTERS CREATIVITY, AND OFFERS A HANDS-ON EDUCATION. 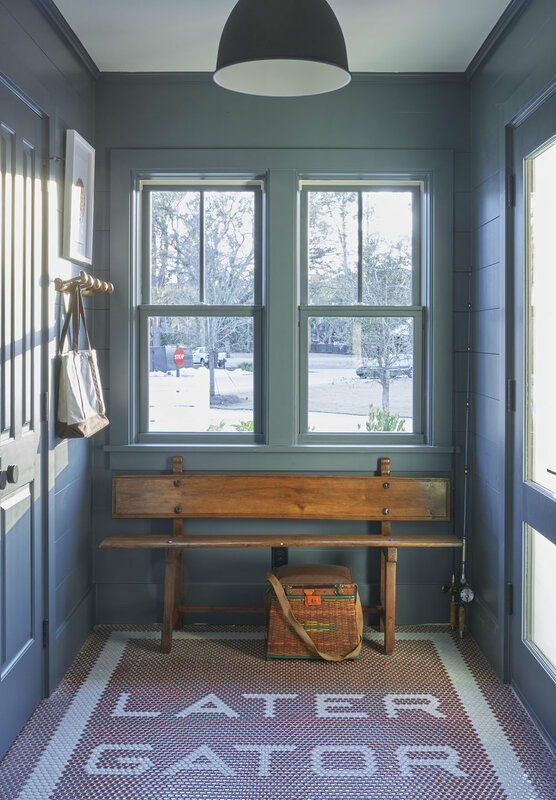 THE Annual PROGRAM INVITES NOTABLE ARTISTS, INCLUDING WINNERS OF G&G’S MADE IN THE SOUTH AWARDS, TO STAY IN THE ARTIST COTTAGE IN PALMETTO BLUFF’S NEWLY CONSTRUCTED MORELAND VILLAGE. 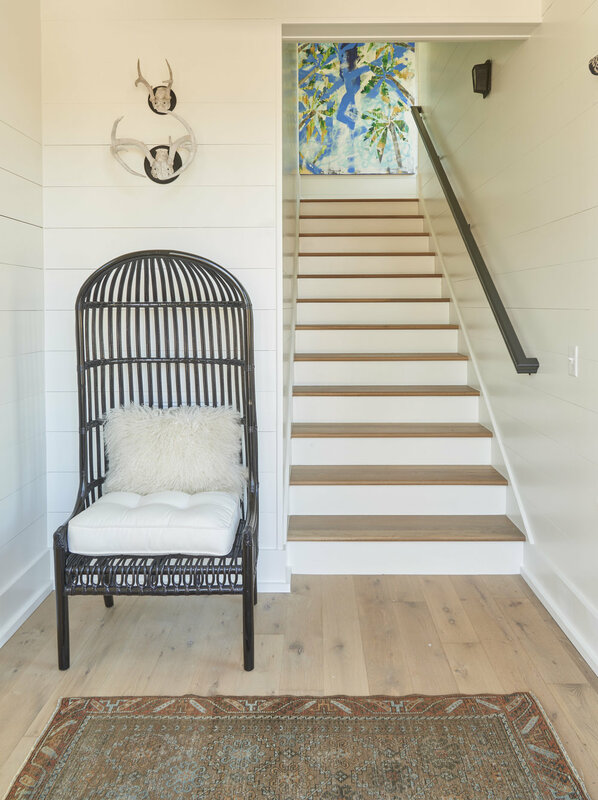 The Artist in Residence cottage at Palmetto Bluff was designed with a fresh take on the Lowcountry architectural aesthetic – creating rooms that are inviting, interesting, inspiring, and unpretentious. Shoreline Construction and 501 South Studio @ Court Atkins Group created a space that is decidedly contemporary through the use of unique architectural elements and furnishings like natural blonde oak floors, white painted nickel-joint wood walls, brick, and open trusses—unifying the spaces with the color white to create a blank canvas, so to speak. The next step was to install the “art” in the artist cottage by layering compelling finishes (like the powder room tile floor) that are essentially art themselves with the fine art collection curated through The Red Piano Art Gallery, featuring some of the best known Southern artists working today including Jonathan Green, Betty Anglin Smith, Mandy Johnson, Addison Palmer, and Mark Stewart. Palmetto Bluff is situated in the heart of South Carolina Lowcountry between Charleston and Savannah, Georgia. Surrounded by rich history, stunning beauty and cultural heritage, Palmetto Bluff is the largest remaining waterfront property on the East Coast. Currently evolving as a residential community and conservation preserve, the 20,000-acre development is surrounded by 32 miles of riverfront and features extensive nature trails; a vibrant Village center complete with river access, boat storage and canoe club; a distinctive food and beverage program; the AAA Five Diamond Montage Palmetto Bluff; and a Jack Nicklaus Signature Golf Course. An array of southern-style residential neighborhoods ranging from multi-million dollar legacy family compounds to more traditionally sized, single-family lots are currently available. For more about Palmetto Bluff, click here. Moreland Village is the perfect home base for exploring the Lowcountry. Live in a place where forest, marsh and waterway meet to create a distinctive natural environment. You can walk the live oak trails, kayak the river, or go fly fishing in the river. Then gather with family and friends for an evening Lowcountry boil under the stars. We’re now offering homesites with breathtaking views across the marsh or adjacent to our pristine nature preserve. For more about Moreland Village, click here.